Geography lessons: The coolest designers redefine the idea of American style in an increasingly global business. 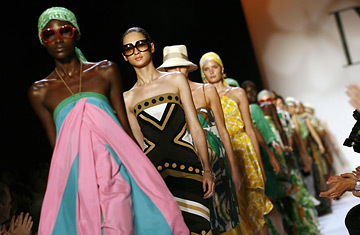 Here, models present creations from the Diane Von Furstenberg spring 2008 collection during New York Fashion Week September 9, 2007. The sidewalk surrounding Manhattan's Bryant Park is lined with posters promoting a new image of Lord & Taylor, the U.S.'s oldest department-store chain. In the pictures, members of some mythical extended suburban family smile as they frolic in their vintage Mercedes convertible or slide into a wooden canoe.